This will probably be easier to do in two batches. Set aside in a pie plate or similar. The dough should be soft and pliable but not sticky. Use a little more flour as needed. Scrape the dough onto the floured board, knead it a couple of minutes, cover and let rest 15 minutes. While the dough is resting, preheat the oven to 375ºF and place a rack near the top. Line two cookies sheets with parchment paper. Divide the dough into 36 even pieces. You can use a one-ounce scoop if you wish — I cut it into quarters, then each quarter into thirds, then pinch off thirds from each third. Whatever works for you. Roll each piece between your palms to form 36 balls. Pinch off bits from the big ones and add them to the small ones and re-roll if you want to to get them about equal in size. into a small bowl. Take one dough ball at a time, coat it with milk then roll it in the sesame seeds. Pick up the coated ball and form it into a rectangle with your hands (try shaping it between your thumb and forefinger), getting the height between 1/2 and 3/4 inch. Place it on the parchment paper-lined cookie sheet. Repeat for all 36 balls, 18 per cookie sheet, trying to keep the height about the same throughout. They don’t spread much, but do leave a bit of space between the cookies. 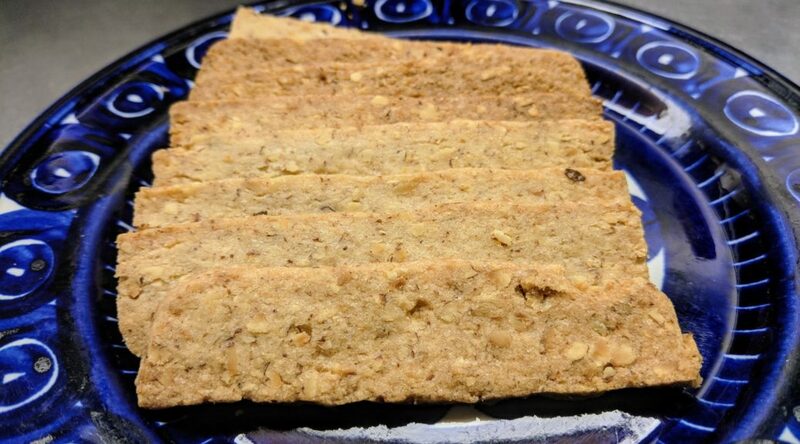 After the first tray of rectangles is shaped, bake on a high oven rack for 14-15 minutes, turning once halfway through. Meanwhile shape the next 18 balls into rectangles. With a spatula, slide the baked cookies onto a cooling rack. Pulse until uniformly ground, scraping down the sides as needed. The mixture will be rough and sandy looking. Transfer to a serving bowl. Cover and refrigerate until ready to serve. Perfect with cheese blintzes, but it will work over ice cream and on other desserts. This recipe makes a good topping for cheese Blintzes. See the recipe for Cheese Filling for Blintzes. and cook over a medium-low heat, stirring as it comes to a gentle boil. Let simmer on a low heat, stirring regularly for about 8 to 10 minutes. Remove from heat. Inspired by a Martha Stewart recipe. Makes enough filling for about 16 blintzes, but your mileage may vary. First off, the amount of farmer cheese is a range because the primary producer of packaged farmer cheese, Friendship Dairies, has reduced the size of their packages from eight ounces to seven. If you can buy farmer cheese in bulk, buy the larger amount, but also, don’t bother buying 3 packages of farmer cheese just to get to 16 ounces. This recipe isn’t that precise. Read the notes at the end of this recipe if you would like to flavor the cheese filling differently, as my mother did, or if you can’t find farmer cheese. Mix thoroughly. Fill the Blintzes as described in that recipe, making sure you don’t overfill them. Cook them as described there. My mother would often serve these with a Blueberry Sauce although I personally prefer sour cream. NOTE: My mother preferred a citrus flavor, so instead of vanilla, she used 1–1/2 tsp lemon juice and 2–1/2 TBL Curacao. I’d consider using some grated lemon rind if I wanted a citrus flavor. NOTE: If you are unable to locate farmer cheese, don’t despair. My mother often had that problem in Colorado and came up with two substitutions. For the recipe above she would drain 2 cups of cottage cheese in a strainer to eliminate some of the liquid: it probably took a 2-3 hours. Alternatively, she’d use equal parts (8 ounces each, by weight) of cream cheese and dry curd cottage cheese, which is much drier than farmer cheese. Inspired by my mother’s recipe. Generally used to fill blintzes or knishes, but you can also just eat it as is. It is very dense. If you want a lighter potato filling, look elsewhere. This can make as much or as little as you like. This is a large recipe, suitable if you are making 3-4 dozen Blintzes, I would guess. My mother would often make larger batches of this filling with 5 pounds of potatoes and 3 pounds of onions. It is dense. Very dense. over a medium-high heat. Add onions and stir from time to time as onions begin to brown. 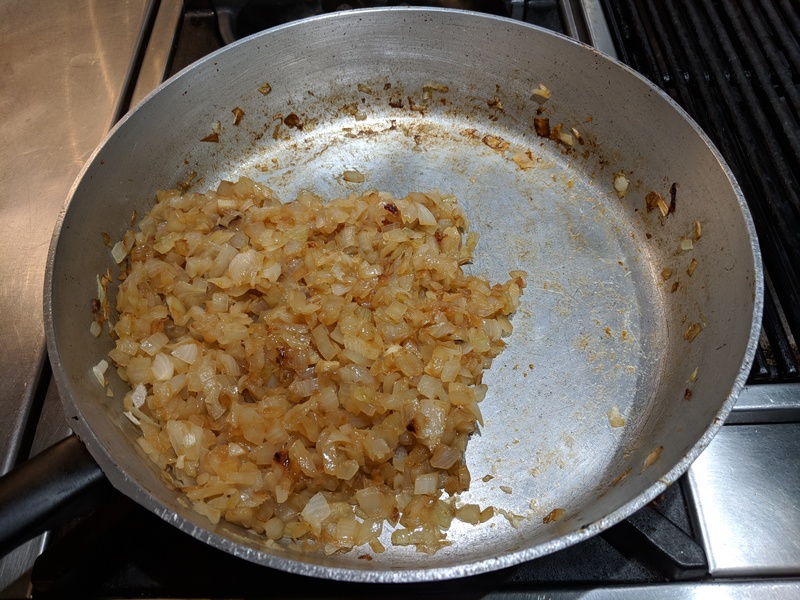 Onion pieces should brown (see photos). You might need to add a little water to remove the fond from the pan. Make sure the onions are sweet and tender. Add more oil if needed, because it’s what will give moisture to the potatoes. and cut into large dice. Place in large pot and cover with well-salted water. Bring to a boil and cook until pieces are fork-tender, about 15 minutes once it comes to a brisk boil. Drain the potatoes and return to pot. Mash them thoroughly, tasting for salt. Add the cooked onions. If the potatoes seem dry, add a bit more oil. Season to taste with salt and pepper. &diamondsuit;ATTNThe mixture should have a distinct presence of black pepper. This is a traditional family recipe. My mother made blintzes, sometimes in batches of more than 100, for big family gatherings. Makes 18 blintzes, but scaling instructions are provided. While this might sound like a big production, in fact you can throw these together pretty quickly once you’ve done it a couple times. 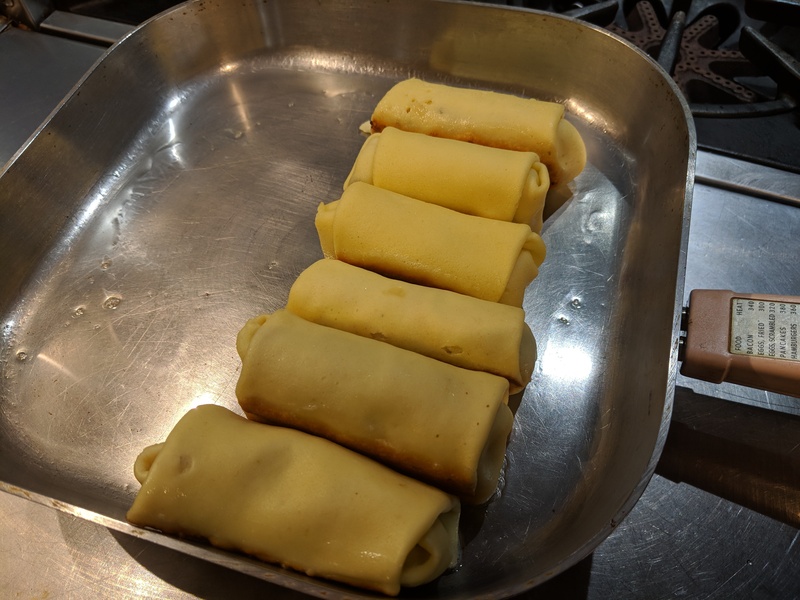 The entire process consists of these steps: make the filling(s), make the batter, cook the blintz wrappers, form the blintzes, cook them, eat them. I prefer to make the filling first so it will be ready to use when as soon as the wrappers are done. Family favorites are Oniony Potato Filling and Cheese Filling for Blintzes. The recipe as given here is best made in a blender, but if you scale up beyond the 4-egg version, you will have to work in batches, mix it with an immersion blender, or use another appliance to mix it. and process again to mix, scraping the blender jar (when stopped) if any flour sticks to the side. If you want to scale the recipe up or down, use these measurements. And yes, they are not exactly linear so pay attention to the chart. To make the blintz wrapper, you need one or two skillets that have a flat bottom about 6 to 7 inches across. It’s better if the sides curve up to a wider width (like an omelette pan) or the sides are very low, like a round, small griddle. It’s harder with a pan with straight vertical sides, but it can work. Two skillets will make the work go faster, but one is fine if that’s all you have. Heat the pan(s) but when you start working make sure they’re on a low heat. If the pan is too hot, the batter will bubble and the wrappers will develop holes. While the pans heat, spread out a clean dish towel on a counter near the range. With a folded paper towel, pick up a little oil and spread it liberally on the bottom of the skillet. 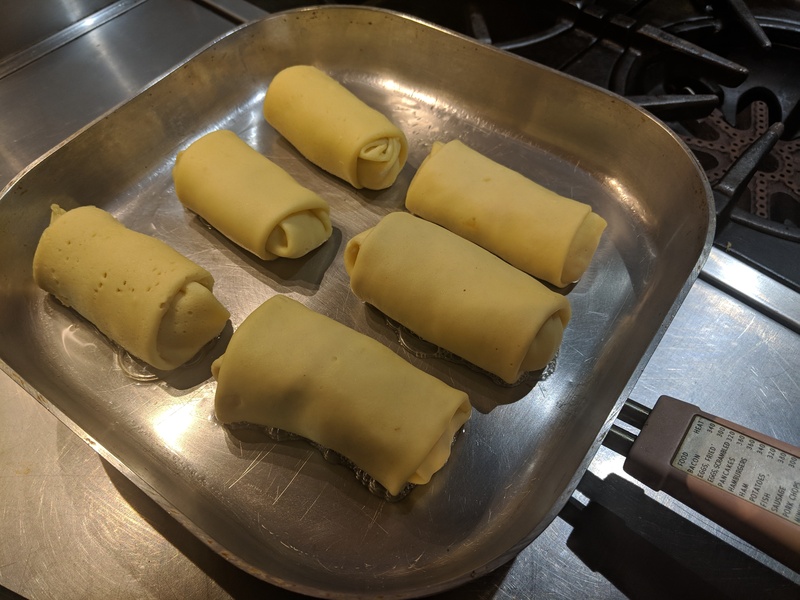 It takes a little more than 2 TBL of batter to make each wrapper and you can easily measure this by using a half full 1/3-cup measure, but whatever works for you is fine. If you’re lucky, you have a ladle that’s just the right size. Grab the skillet handle with your dominant hand, quickly pour the measured batter into the center and start to move the pan in a tilting circle to spread the batter out into an ever-widening circle until it reaches the edge of the flat area of the pan. If you reach the desired size and there’s still some batter you can keep circling to distribute the batter or pour the excess back the bowl/blender jar containing the unused batter. Set the pan back on the heat and wait for the wrapper to cook. If there’s a hole or two, you can always use a spoon to drip a few drops of batter to fill in the problem area. If the wrapper is dotted with many small holes, it means the pan was too hot. Don’t despair, such wrappers work for more solid fillings like potato, but will be problematic for moist fillings like cheese and fruit. When it’s done cooking, the wrapper will have no wet areas on the surface. Run a butter knife around the edge of the wrapper to release it from the pan. Invert and knock the pan onto an empty spot on the towel. The wrapper should release easily and hopefully it has a bit of color to it. (If it doesn’t, just move on and let the next one cook a bit longer.) Return the pan to the burner immediately. &diamondsuit;ATTNBe sure to remove any attached crumbs from the pan and grease the pan before making the next wrapper. As the wrappers are made, you can overlap cooled ones on the towel, but don’t put them right on top of each other completely as it will be hard to separate them. If you want to make a lot of blintzes or delay the filling operation to, store the wrappers. To do so, tear a square of waxed paper and place it on a dinner plate. Place 3 wrappers offset enough that they barely extend past the edge of the plate and don’t overlap completely. Repeat layers of waxed paper and 3 wrappers until they are all stacked. Put the entire plate in a sealed plastic bag and refrigerate. &diamondsuit;ATTNDo not wait more than 24 hours to fill them as they tend to stick as they are somewhat moist. To roll up a blintz, follow these steps. Keep in mind that it’s a little easier to learn with a solid filling like potato rather than a looser filling like fruit or cheese. Put one wrapper in front of you on a flat dry surface. &diamondsuit;ATTNBe sure the browned side (the cooked side) is UP and the uncooked side is down. Re-read the last sentence! If the wrapper has uneven edges or holes on one side, put that area closest to you as it will wind up on the inside of the finished blintz. Put about 2 to 3 TBL of filling in an area about 1 by 3 inches crosswise, about 2 inches from the closest edge. Lift the edge closest the filling and fold it over the filling. Roll the entire assembly, gently and set it aside with the open edge down so it doesn’t try to unroll. If it tears as you roll, it means you tried to force too much filling into the blintz. If you run out of space for the blintzes, stack them with waxed paper between layers and leave a little space between them if you can. When you have formed all the blintzes, you have a couple choices. 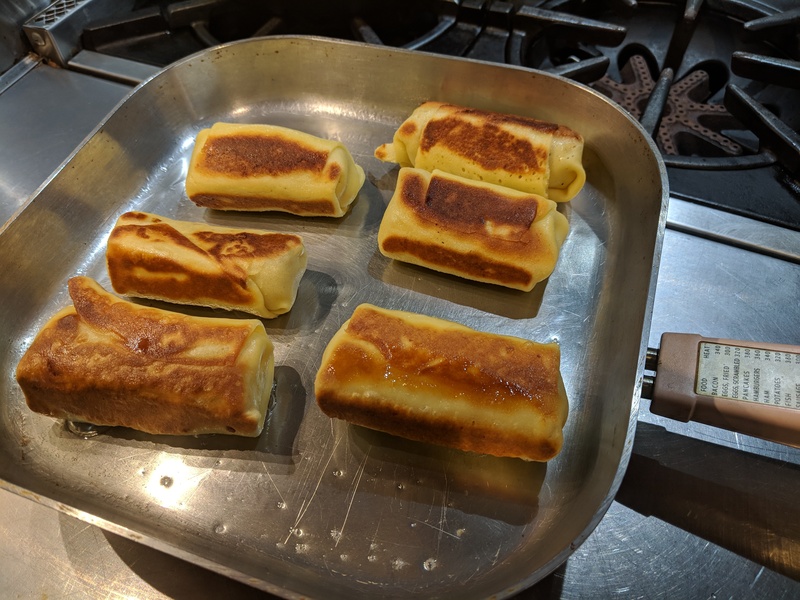 You can cook them immediately (see below), you can refrigerate them (wax paper between layers, space between the blintzes on each layer and stored sealed in the refrigerator for up to a couple days) or freeze them on wax paper-lined trays leaving space between each blintz. After they are completely frozen they can be transferred to bags (no wax paper needed). 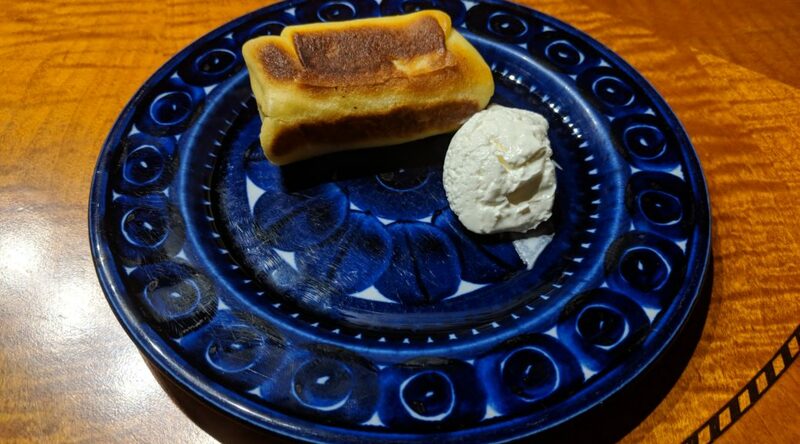 Frozen blintzes can be defrosted in the refrigerator before proceeding with cooking. To fry the blintzes, obtain an electric frying pan with a pink handle. 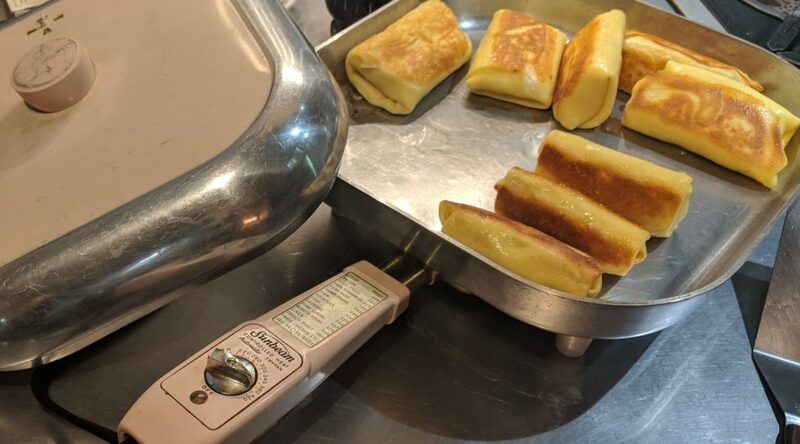 Yes, an electric frying pan set to 375º F is ideal for cooking these, but if you don’t have one, use frying pan(s) on the range, but once they heat up, keep an eye on the heat so the blintzes don’t brown too quickly or burn. Use vegetable oil (or margarine or butter) to grease the pan, then add the blintzes, leaving space between them. I try to cook them on 3 sides (the ends never get cooked), which means after the first side cooks I have to prop them up against one another (see photos). I think my mother just cooked them on two sides. Once they’re nicely golden all around, serve them. From my mother’s recipe, who started with Jenny Grossinger’s classic recipe. Tasty, simple, and quite delicate. Also vegan and gluten-free. Preheat the oven to 350º F and lightly grease five 4-inch tart pans (see note at end). and mix on low to incorporate. Press the dough into the tart pans and bake for 20 minutes, or until starting to get dark around the edges. Slice each into 6 triangles while still warm, then let cool completely. 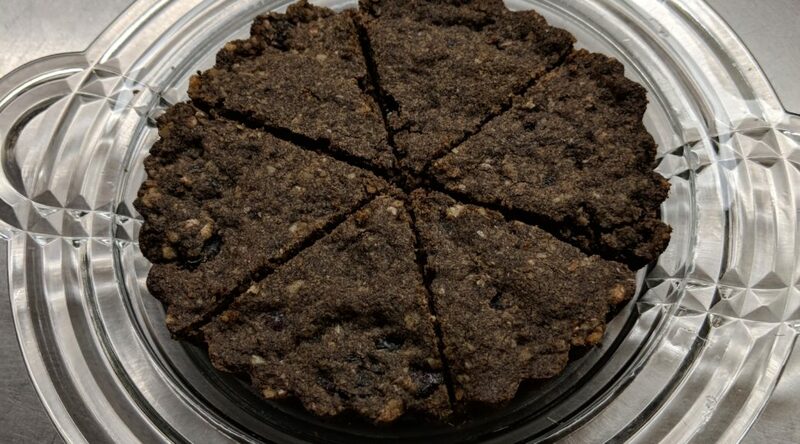 Note: The original recipe (adapted from Gluten-Free and Vegan Holidays by Jennifer Katzinger) calls for one 9-inch tart pan, sliced into 10 triangles. These light, fragile cookies break easily which is why I suggest smaller pans and cookies. Tons of herbs create a delicious flavor and a vivid green color. 40 to 60 pieces, depending on how you cut it. Preheat oven to 400º F. Wash and dry the following fresh herbs. NOTE: You may need an additional egg or two if the mixture is very thick. Oil a 9×13 baking sheet with sides (half-hotel pan or jelly roll pan preferred to a cake pan). Line with parchment paper and oil that too. Pour the batter into the pan and spread evenly. When the kuku is baked and cooled, cut it into pieces. I like to cut it into 13 1-inch strips and then cut the strips in anywhere from 3 to 6 pieces depending on the size of the servings. Cut lavash into pieces that are the same length as the kuku pieces and a little more than twice as wide wide. Note: Leftovers need to be kept refrigerated. 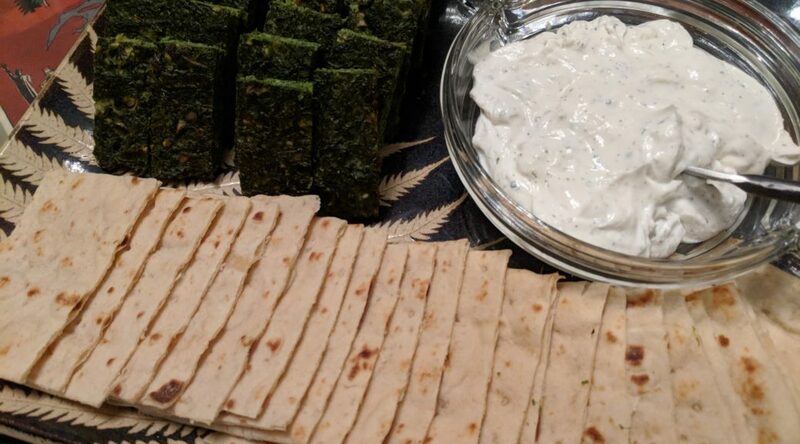 Adapted from Silk Road Cooking by Najmieh Batmanglij. Crunchy with a strong hazelnut flavor. And they're easy: the nuts don't have to be toasted or skinned. and drizzle into the processor bowl. Pulse just until the mixture resembles damp crumbs – it shouldn’t be a smooth mass, but it should stick together when pressed. Dump the mixture into the lined loaf pan and spread it evenly. Press it very firmly and compactly. Fold the foil over the dough and wrap it tightly. Refrigerate for 2 hours or overnight. Preheat the oven to 350ºF. Position racks in the upper and lower thirds of the oven. Grease two cookie sheets. Unwrap the dough and transfer it to a cutting board. Use a long sharp knife to cut the dough crosswise into 1/4-inch (or thinner if possible) slices. Use the knife to transfer each slice to the greased cookie sheets, placing the slices 1 inch apart. The slices will be fragile and require the support of the knife in transit. Bake for 12 to 18 minutes, until the cookies are golden with golden brown edges. Rotate top to bottom and front to back halfway through for even baking. With a metal spatula, transfer the cookies to a rack to cool. May be kept in an airtight container for several days. I just substituted 2/3 cup raw almonds for the hazelnuts. But I didn’t think the almond flavor was strong enough; next time, I’m going to use almond extract in place of the vanilla, or half almond/half vanilla. NOTE: &diamondsuit;ATTN To line pan with foil: Invert the pan, cover it with a piece of foil 4 inches longer and wider than the bottom of the pan, and with your hands press down on the foil around the sides and the corners to shape it like the pan. Dampen the inside of the pan slightly. Without tearing, press the foil into place in the pan. This is a sweet tart dough. Makes 2 tart shells. Use one, freeze one to use later. Mix on low until the dough comes together. Finish mixing by hand with a large rubber spatula. Divide the dough into two flat, round disks. Double wrap tightly in plastic wrap and chill for at least two hours. One hour before baking, roll out the dough on a heavily floured surface, until it is just shy of 1/4-inch thick. Roll the dough back onto the rolling pin, then gently roll it out over the tart pan. Press the dough into the pan to shape it, then cut off the excess, leaving 1/4-inch of overhang. Chill for one hour. Adjust oven rack to center position and preheat the oven to 350°F. Remove the tart shell from the fridge, trim the overhang off of the edge of the tart, patch any thin parts or cracks with excess dough. Line the tart shell with foil and fill with weights or beans. Place the tart in the center of the bottom rack of the preheated oven. Bake for 20 minutes, rotating halfway through. Remove the weights and foil, and continue to bake until the bottom is golden brown, about 15-20 additional minutes. Cool the shell completely before removing from the pan or filling. Simple as can be. The recipe readily scales up for a bigger crowd. Measure the flour by weight: you can scale this recipe up. See the note at the end. Stir until a ball forms. Transfer it to a clean bowl and cover with plastic wrap or a lid. Let sit for 18 to 24 hours and leave at room temperature. After the rising time, the mixture will look a bit bubbly. Gently dump it onto a floured board, shape into a rectangle. Divide into separate pieces for each pizza (two in this case). For each piece, pull the four corners into the center. Smooth into a ball, dust with flour and place on work surface with the seam down. Let rest for 1 hour covered with plastic wrap or a damp towel. &diamondsuit;ATTN If you’re working ahead of time, you can place the balls of dough in the refrigerator for up to 3 days. When you’re ready to use the refrigerated dough, remove it from the fridge one or two hours before you’re ready to bake. Dual pizza stones transmit the heat better. Start preheating the oven. 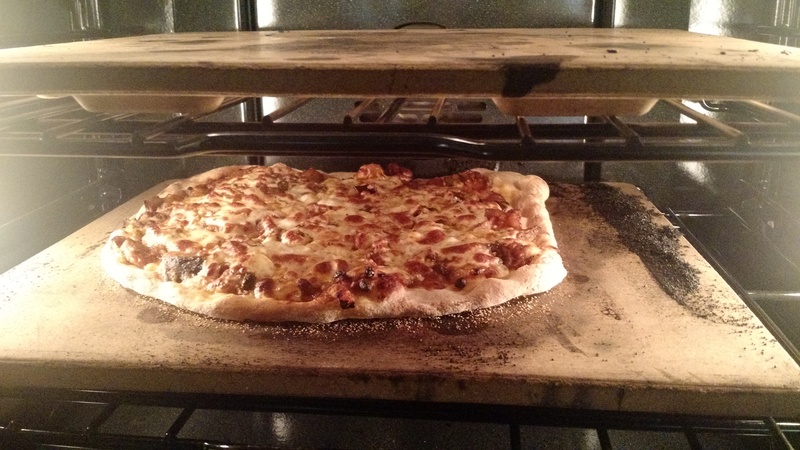 I bake my pizza on a pizza stone with &diamondsuit;ATTN another pizza stone on a shelf about 4 to 6 inches above it. I bake at the highest temperature, 550º F convection in my case, so it takes almost an hour for the oven to heat up and for the stones to get thoroughly hot. Be sure to wait until the stone(s) heat up completely. Form the pizza by gently forming into a circle, handling the dough as little as possible. Be sure to leave a bit of an edge around the pizza to form a crusty edge. Stretch the dough to an 11-inch round. Transfer the shaped dough to a baker’s peel that is generously coated with cornmeal. Top the dough with ingredients. Bake for 6–1/2 minutes (adjusting for your own oven’s temperature). When &diamondsuit;ATTNscaling up this recipe to make more pizzas, use this guide. Per pizza 160g flour, scant 3/4 tsp salt, speck of yeast (keep reading), and 1/2 cup water. For 6 pizzas the proper amounts are 1kg of flour, 4 tsp salt, 1/2 tsp yeast and 3 cups water. 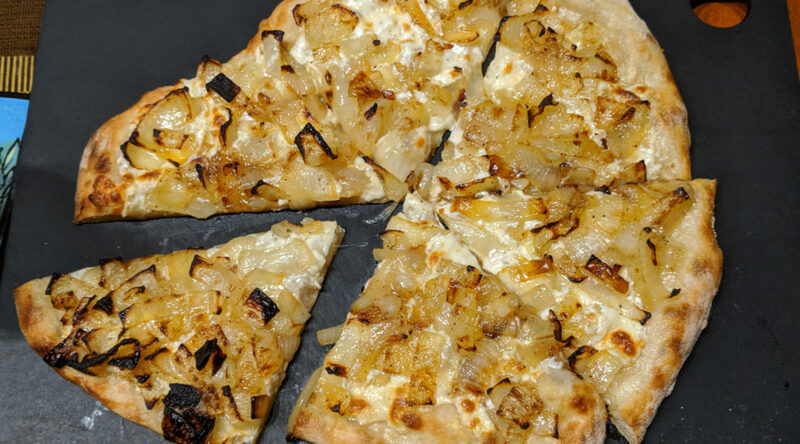 This caramelized onion pizza (pictured above) is made by slow-cooking chopped onions in olive oil. Cover the dough with mozzarella and bits of shaved romano cheese and then cover with a thick layer of the golden onions. Follow baking directions above. Easier than I ever imagined. Note: A larger octopus will work, just make sure it fits in your pressure cooker and adjust the cooking time. I’ve also cooked 2 1–1/2 pound octopuses at once in my 6-quart pressure cooker. When you (or the fishmonger) clean the octopus, be sure to remove the beak, eyes and open the head and clean it out. Rinse the octopus, especially inside the head as there might be a little sand in there if it isn’t cleaned out thoroughly. &diamondsuit;ATTN Be absolutely certain you don’t overfill your pressure cooker! Bring the pressure cooker to high (15 lbs) pressure. Set a timer for 15 minutes. When the time is done, bring the pressure down quickly and check that a paring knife easily slips into the thickest part of the leg. If not, close the pressure cooker, bring it back to pressure and cook for 3 minutes; then re-test it. Generally I have found that 15 minutes is enough time. Add the cooked octopus and refrigerate for at least 3 hours, turning the octopus at least once in the marinade but more often if time allows. Light coals or light gas grill. Grill the octopus whole, making sure you don’t char the tips of the legs too much. When it’s gotten some color, it’s done. Remember, it was fully cooked when it came out of the pressure cooker. Serve, either cut into legs or bite-size bits, drizzled with more olive oil, salt, pepper, lemon juice or your favorite condiments.